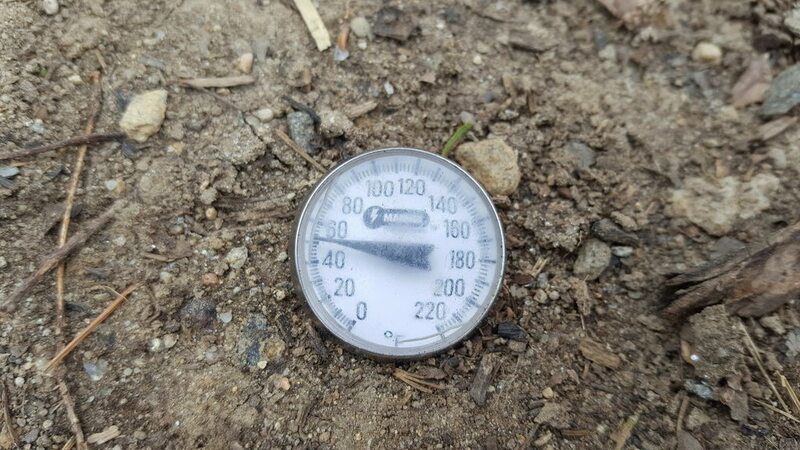 Decided to check my soil temp. Both 4.5" down and 2" down. Similar results..
Just as I suspected.. Cold...Under 40°F. No planting till Mid May here. do you ever use poly to try and warm your garden plots up quicker? Good question. I assume you mean the black plastic stuff. I don't for couple reasons. 1. Air temp drops to 30s so whats the point in planting. Cool weather crops would do fine. 3. Need to till soil and want to take my time. 5. Rain wont get beneath and that's important around here to get the Spring soil moist. 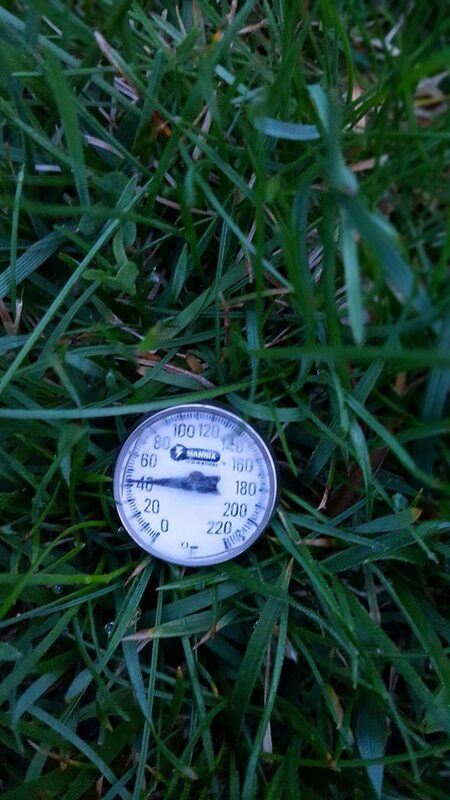 Soil temp 4 inches below surface still cold but warmed up bigly from yesterdays heat. 38° yesterday morning to 45° this morning. yeah, I meant just as a temporary cover to speed the soil warm-up along...I've been using (E Central Minnesota) the same couple sheets of black poly over and over again and it does seem to make a difference in the soil temps where I use it and where I don't and it keeps the weeds at bay. I was concerned about the inability to get moisture into the soil but we are pretty sandy here and it doesn't take too long upon removal to soak the frequent spring rains back into the soil. Haven't put mine out yet but I'll do so this weekend and try and track the temps. Lucky you, kinda, with the sandy soil.. Not here.. I got cement and I need all the moisture in there I can get. lol . 35° this morning. Even with a warm soil our last frost doesn't happen till early May so even with a warm soil, it's not like I can plant anything anyway... 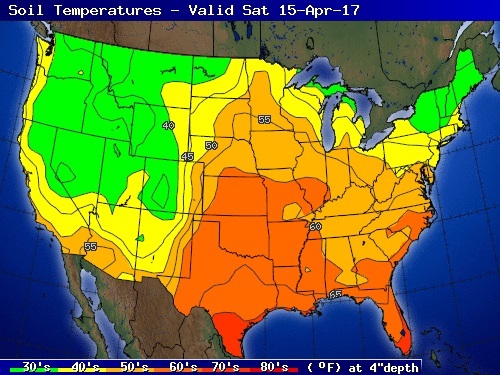 But I agree, would be nice to have the soil at 60° in Mid May instead of like 50°. I might try it out one year. Thanks for the motivation. After the few days finally being warm (June like for 2 days) here is the soil temp this morning... Still cold 4" down. Interesting! I should check the soil temp here just for the fun of it! Yesterday I was pulling some hen and chicks the deer destroyed (never mind the "deer resistant" theory) and soil still seems very cold. I know it was deer because of tracks and deposits!!! Like Ghengis, sandy here, any added black soil, peat, whatever, immediately gets brown and gritty. 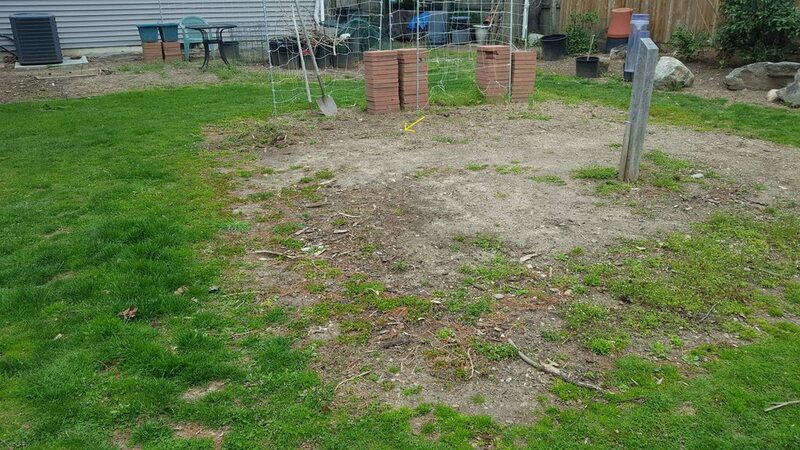 Some areas of my yard I can dig down a foot or more to find bright gold beach sand. In Illinois, I had heavy clay, imagine my surprise the first time I dug here and it was so easy! Interesting! I should check the soil temp here just for the fun of it! You should, let me know what you got. So I forgotten I left the probe in the garden and I went to check it yesterday 1pm. No sun. It's actually 50° when you look straight down at it,. So the soil is definitely warming up 4" down now thanks to above freezing days and night and days in the 60s. Today 80s! From the source links in 1st post... 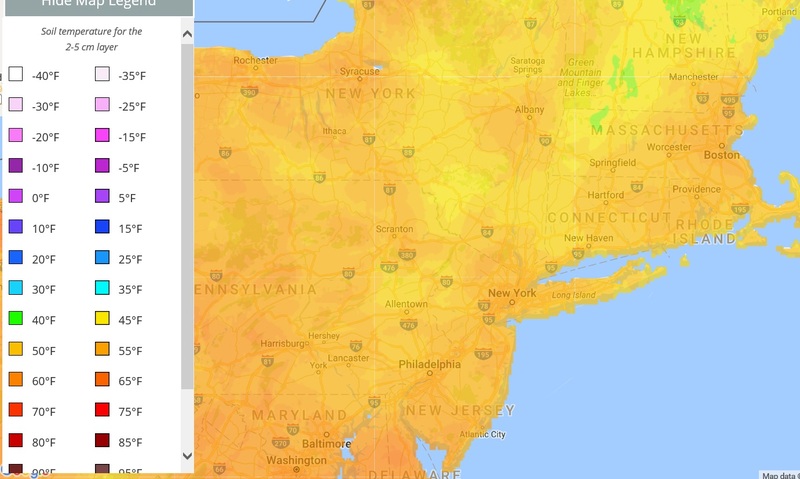 Seems off for this area now but upper 40s would be close to actual.. This one more accurate. Showing 50s. Nice! My soil was up to 60° yesterday since the air hit 85! (it's happened before this early). But back to reality now so the soil should go back to near 50°. Nice warm spike for it though. Weeds coming alive unfortunately.